Textboom gives you the same tools that big name pizza chains use, for a fraction of the cost. 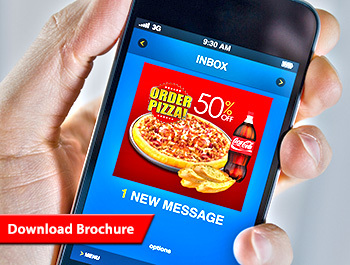 Using text messaging to promote your pizza shop or pizzeria is without a doubt one of the simpliest and most cost effective ways to boost sales. We make texting simple, so you can get back to doing what you do best, making pizza! Using text messaging is an easy way to communicate directly and instantly with your customers to remind them “You don’t have to cook tonight!” Offering text based coupons and discounts is a great way to get more returning business, especially on slow nights because you see instant results. Our Pizza Shop / Pizzeria package offers you a YEAR worth of text marketing for one low price. Our plan includes 15,000 messages, your own custom keyword and the most reliable mobile marketing platform available. All for just $500.00 per YEAR – Less than the cost of just one convential print ad. It’s that simple for your customer to join and from that point on you are able to send promotional offers to them via Textboom. You simply login to your Textboom account from anywhere with internet access, click broadcast, type your offer and hit send. All your customers receive the promotion within seconds and you get customers ordering the same day. Mobile marketing with Textboom offers your Pizza Shop or Pizzeria instant, real results and only costs $500 for an entire year. We also offer a complete, professionally designed marketing package to help “kickstart” your promotions and build your text list. Our marketing package includes 500 custom full-color postcards, a counter mat and table tents – This package is optional, but is a steal at only $150.